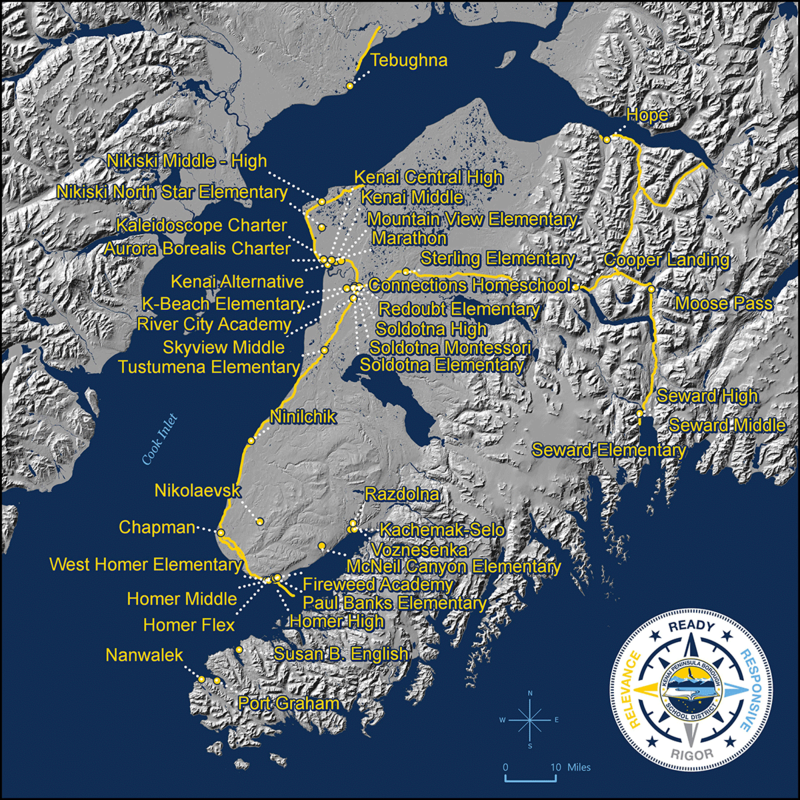 Welcome to the Kenai Peninsula Borough School District! The District covers the entire borough (25,600 square miles) and includes 43 schools -- 14 elementary, four middle, ten secondary and 15 small schools. We are proud that 85% of our district graduates enroll in some form of post-secondary education or training. BUSING AND HEALTH ISSUESThe safety of your child is always important. This includes the time spent traveling to and from school on the buses. If your child has a medical condition that might require attention during transport or is important for the safety of other students or the bus driver and attendant, please complete the medical information form. You can get this form from your child's bus driver. Another way to make sure the driver and attendant have information about your student is to contact the school nurse and allow him/her to provide information to the busing staff. The nurse must have all pertinent information related to your child's condition. You must sign a Release of Information form that allows the nurse to communicate with bus drivers and/or other bus personnel. Original birth certificate. A birth certificate is required for verification. All students need to provide a copy of their current record of immunizations. Prior to first entry into school, a child must be fully immunized as required by law. All students new to the District or those who have been out of the District for two or more years need to have a parent/guardian complete a Tuberculosis (TB) Risk Assessment for Alaska Students. If responses in the Tuberculosis Risk Assessment show the need for follow-up, any further action must be completed and submitted to the school nurse within 90 days of enrollment. Please contact the school nurse if you have questions. ** These initial registration requirements are not applicable for students experiencing homelessness or those in Office of Children's Services (OCS) custody/foster care; please contact your school secretary to get more information on these special circumstances.